Amazing day. I worked remotely, half day, and had the morning with the kids and the long afternoon and evening with the kids. We played and worked in the afternoon, ate early, went to bed early. The kids need their sleep and we needed the time together. So, so happy. I got up early and got things ready; Big Bro’s lunch, all shoes/jackets, vitamin piles, toast for breakfast. Big Bro was moving slowly. He wanted to make sure that Cocoa had fresh salad for breakfast. Seems reasonable. All were dressed and then we were out; I packed Big Bro toast and butter for breakfast (for the car), along with a banana, and all kids then wanted toast. NOTE TO SELF: NEVER make a take-away breakfast for one kid. ALWAYS make enough of the take-away breakfast for several kids. Big Bro proceeded to “tease” the rest of the kids with “mmmm. toast and butter.” Me: “stop that [Big Bro], you’re teasing. Him: “but what do you want me to do mommy, lie?” Ugggh. Traffic was not bad at all – it kept moving. Despite our late start we had enough time to drop off Red/Twin Crazy/Twin Husky first, and then me with a solo drop off for Big Bro. Twin Crazy and Twin Husky were excited about “school”. There was playdough set out and Twin Crazy started jumping up and down – she almost knocked me over to get to the table with the playdough. Both kids sat in their own seats for playdough play. Twin Husky even had a blue tray, his favorite color. Drop off for Red was sooooooooooooooooooooo easy. Having her friends there makes it easier for her. I parked the car in a nearby neighborhood and me and Big Bro walked to his school. 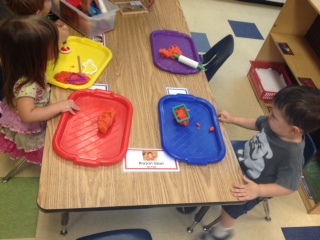 We laughed about how Twin Crazy and Twin Husky love their new school and the playdough. 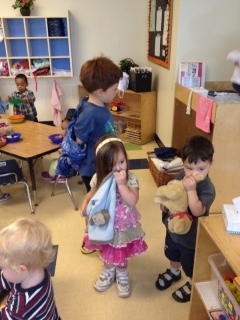 We talked about how I enjoy walking him “solo” to his classroom. We talked about his homework and how proud I was of him and how fast he can count and also how he writes sentences. He talked about how he likes stepping on the crackly leaves. I watched him as he walked along the leaves. I gave his homework to his teacher and seemed more proud of it than he. He told me to go once he got settled in the group of his class. I walked to the car feeling really good. I was ready to go the 5 minutes to Starbucks to work. Close to the kids; and only for a couple of hours. Starbucks. Another big coffee. Setting up my computer and phone. Ready to go. It was a slow start to be honest. I was cold. I had some conference calls; confirmed attendance for the more recent forum; followed up on invoice payments, arranged conference calls for selling new memberships. I packed up around 1 PM and headed to the school. I took another conference call from the car at 1:30 but finished it up in time to get Big Bro. I smiled and clapped my hands when I saw Big Bro. He smiled back. I feel like I will never forget that expression on his face. He looks like he’s having fun. He let me hug him and kiss him and hold his hand to the car. 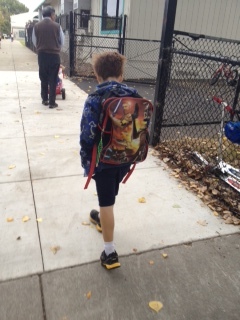 On the way over to pick up the rest of the kids he told me how he has physical ed now that he’s in first grade. He was excited about picking up the siblings. He gets a kick out of all of them being there. He gets a kick out of Red being in his old classroom – how he knows the routine. He wanted to get there in time to still see the kids sleeping… he wanted to see where Red’s mat was. We picked up Twin Crazy and Twin Husky first since their classroom light was on. Twin Husky came out first and ran into my arms and onto my lap, hugging me. The other kids then started to cry for their mommies. Twin Crazy was still going potty so she came out several minutes later. Both running in my arms. Both in my lap. Slow hugs to both since they were still groggy. Both sucking their thumbs. One blanked, one borrowed stuffed animal. 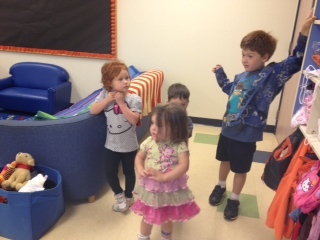 Then we said goodbye to their new friends and said we would see them next week. I will have them on Thursdays and Fridays. Pick up for Red was fine; she was groggy and her hair all over the place. 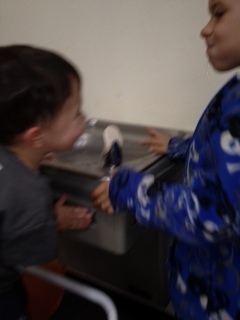 Kids had a good time at the water fountain. The boys were happy to be reunited. The ride home was fine; not much traffic. I took a conference call with a Director to catch up on a number of things and then also had a call with my Admin (who is wonderful). I will need to do some tidy-up work tonight… things that cannot linger to next week. 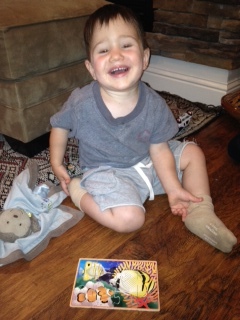 At home, we colored, took in the trash bins (Red was so proud), had a snack, and then got ready for dinner. I also called for a dentist appointment for Big Bro since his first adult tooth is coming in behind his baby tooth. A botched tooth fairy moment!!! We never even got a wiggle! 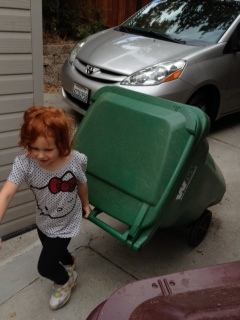 Red was SOOOOOOOOOOOOOO helpful… she started with the trash bins but then she went to caring for Cocoa (getting food, re-filling water), helping with Twin Crazy/Twin Husky, cleaning up her room, etc. She couldn’t stop. I had to hug her. I missed her so much. 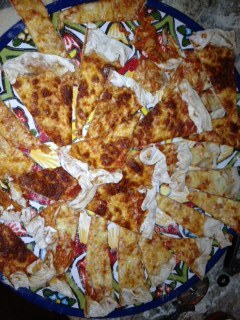 We had home-made pizza tonight; Red had peaches. After dinner Big Bro relaxed; he is still not feeling well. I need to make another doctor appointment for him. He’s had this stomach thing now for a week. Not normal. The rest of us did puzzles. I am fairly certain that this was the first time Twin Husky did a puzzle. I had fun teaching him but he has little patience. Twin Crazy was much more persistent. Both were extremely proud of their progress. Twin Husky was on a roll and then decided to go pee-pee in the potty about 5 times non-stop. He is still talking non-stop about which family members have vaginas vs. penises (or peni?). I broke out the chocolate chips for the kids. PJs. Then books for the boys. 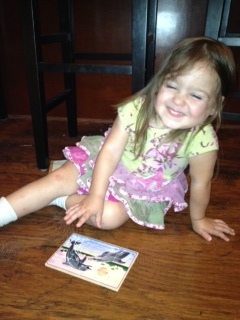 Books for the girls. Big Bro’s belly ache. Twin Husky loves books about balls. He told me that there is a basketball net at school and he played basketball. He threw it into the net and the ball went down. He showed me over and over again about the ball and the net. He is such a guy. Nightime was a bit long since the kids went down much earlier than normal – plus the chocolate chips did not help. There was a lot of back scratching, belly aching, and talking about vaginas (the girls are already doing girl talk). I just had to laugh and go to my room. I just took a shower, and finished up some work. The house is so quiet, with the exception of the crickets chirping outside. I’m looking forward to tomorrow. Chocolate Thursday. I will have to take Big Bro and Red to school/daycare, but will have Twin Crazy and Twin Husky with me all day. I will also have some conference calls that I scheduled during highway travel time, when the kids are quieter. That seems to be working well. It also helps me take advantage of the commute time and grab some extra hours that I need. It was a great day of multi-tasking – having the kids all together, yet also having some one-on-one time with Big Bro and each of the other kids. It was a full day and I feel like I used my time wisely. I had fun with the children and honestly I am not worn out from today. The 1/2 days actually make a big difference for me. I was able to have a leisurely afternoon and evening with them. Nothing rushed. Time to “exist” with them versus running around like an idiot. It makes a huge difference. I feel it myself and I think the kids can see the difference. 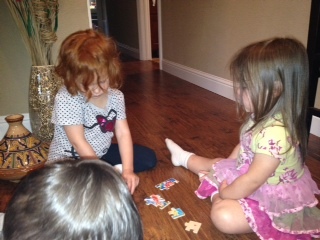 Comparing last night to tonight is like two different families… we had time tonight to play, laugh, and be. It was a great day. « September 4: First days! Don’t worry about Big Bro’s tooth. I’ve had that with several of the kids. Once, the adult tooth was so far back I was scared but the dentist said it would move forward once the tooth fell out. She said there was no reason to pull the baby tooth. She was right! After it fell out, the adult tooth moved right into place. Whew! He was so brave! I needed a drink afterwards. Thank goodness for Guinness. I miss you! You are sooooooo the expert with all of your kids! So glad to have you around! Miss you!! !